A few months ago, Mike and I were having a discussion regarding family heirlooms and how they have begun to slip away from our generation. This year my mom spent the holiday in town and came over Christmas day. She brought along with her a nativity full of gifts for our exchange. 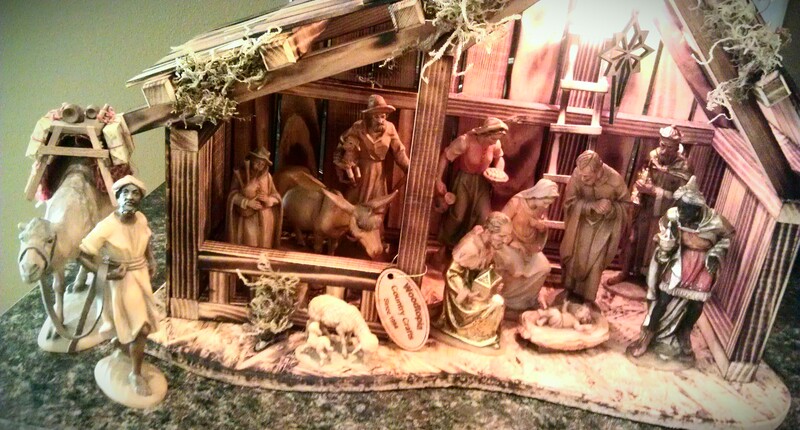 Since the nativity was unwrapped, I had an inkling of what was in store for me. However, I did not realize it would be so sentimental in nature. She wrapped each piece individually, and as I opened them, she told me the story of how my grandfather bought a single piece each year. Each is hand crafted and truly beautiful. I’m not sure how many pieces are available in the collection, I know there are more than I have, but at some point my grandparents must have elected that ‘their’ set was complete. Inside the nativity my mom tucked away a few pictures of my grandparents and one of the nativity scene, set out in their home. I can’t explain how precious it is. All I know, is I will do my due diligence to keep it safe so that I may one day pass it along to my hypothetical children. ~ by sonja on December 25, 2011.